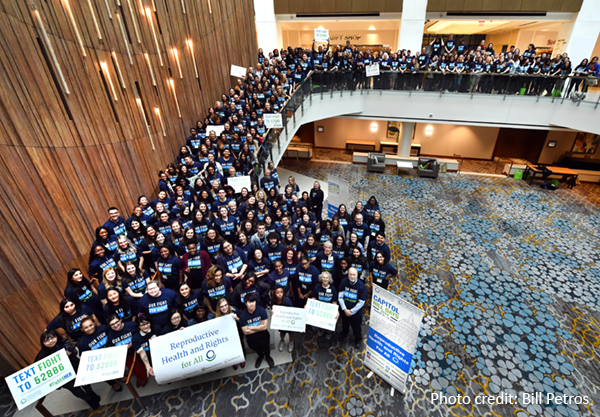 This past weekend, 350 activists stormed D.C. for the weekend to speak out against Trump’s Global Gag Rule, and to urge their elected officials to support the Global HER Act, and a robust $1.2 billion U.S. investment for international family planning, including $70 million for UNFPA. Student activists and Population Connection Action Fund members and supporters from thirty states and D.C. gathered for a weekend of learning about the impact of U.S. policy on real lives abroad, the international effort to halt the damage of the Gag Rule, and to defend the reproductive rights of individuals around the world. Advocates also engaged in discussions about reproductive justice and effective storytelling, and learned tangible skills about how to effectively engage with our #Fight4HER campaign and to plan attention grabbing grassroots events and actions. The weekend kicked off with the presentation of the fourth annual “Empower Her, Empower Humanity” award, presented to Congresswoman Jacky Rosen of the 3rd district of Nevada. In her relatively short time in Congress, Congresswoman Rosen has proven to be a fierce voice for women and reproductive rights. One of the many highlights of the weekend was hearing from Dr. Tlaleng Mofokeng-better known as “Dr. T”- an abortion doctor and reproductive justice advocate from Johannesburg, South Africa, who rousingly inspired the crowd to use their voices to speak up for social, reproductive, and economic justice for all people, and to trust black women, who’ve been organizing and standing up to oppression for a very long time, and who are the backbone of the current resistance to Donald Trump. At the lobby day following the weekend, student and veteran advocates swarmed the Capitol, meeting with their Senate and House offices. 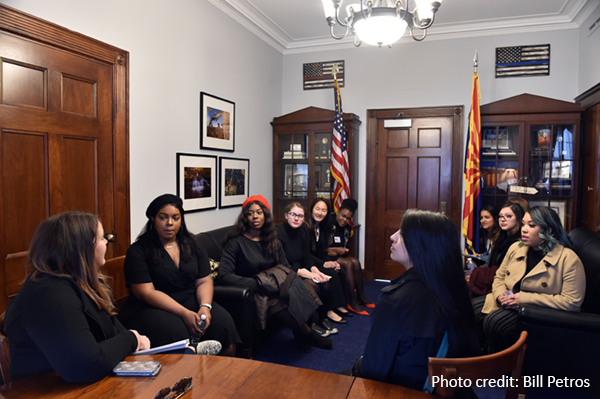 For our large contingents from Arizona, North Carolina, and Ohio, constituents stood for meetings in hallways and gathered in special reserved meetings spaces to accommodate the huge numbers of activists eager to speak to their legislators. A highlight of the day was a young Pittsburg advocate, a constituent of Congressman Mike Kelly of Pennsylvania, who bravely hosted a “meeting” with a cardboard cutout of the Congressmen after he refused to meet with her. She asked him loudly and clearly to support the #Fight4HER, and the millions of individuals abroad whose lives depend on repealing Trump’s Global Gag Rule. 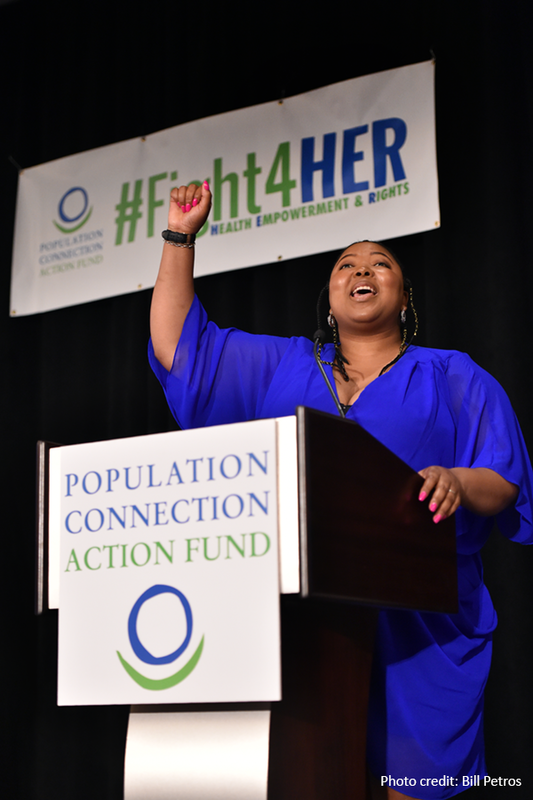 Armed with resources about how best to #Fight4HER, we’re looking forward to this tremendous group of activists leading the #Fight4HER through the remainder of 2018 and beyond. As a donor, you can support Population Connection by donating to them through your employer’s workplace giving program. Payroll pledges made through employer-sponsored charitable giving programs represent a cost effective and near effortless way to support your favorite charities. As Population Connection's workplace giving partner, America’s Charities can help your company design and implement a program centered on supporting their work - through workplace giving campaigns, employee fundraising, cause-focused signature programs, volunteerism, donation drives, matching gifts, Dollars-for-Doers, In-Kind Giving and other employee engagement and philanthropic initiatives. Click here to request a demo and learn how we can help you do this.